The nearly $10 million project began over 20 years ago but stalled due to funding, officials tell USVI News. Governor Mapp said the project was necessary for flood mitigation and others there Monday are weighing in. “We’re opening It because we have to look at the other side to the project. 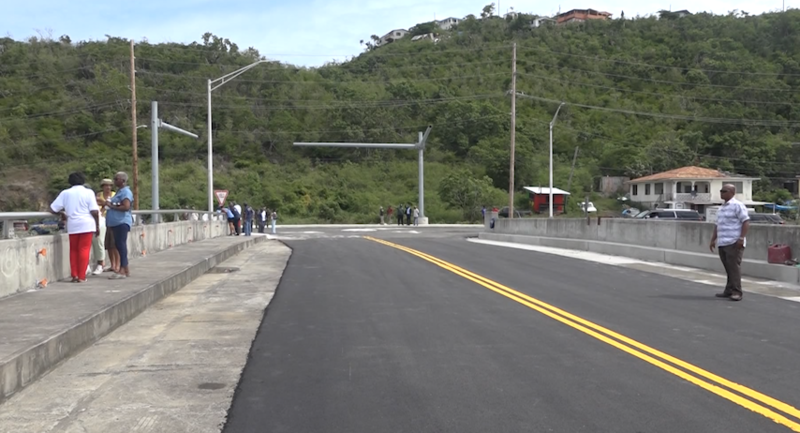 And now that the Army Corps has found the funds to complete the whole flood mitigation so we’ll meet with other community residents and go through what that plan is and get their input,” Governor Kenneth Mapp, US Virgin Islands Governor said. “I like the idea of the bridge but what I don’t like is the fact that some of these homes might have to go because I think the people here the mortgage has been paid these are life longers here and I think there should be some better adjustments made on the Governors part,” Margaret Price a St. Thomas resident said. “I’m glad to see that it is finally open because it should have been open a way long time so it is a blessing. I am blessed to see this happening and I just want the governor to take care of us a little better, he’s doing his best I believe so I am grateful,” Blinda Millard a Nadir resident said. “This administration we’ve put a lot of effort and time into making improvements in this community and this is the first of many other initiatives to come,” Dawn Henry, Commissioner, VI Dept. of Planning and Natural Resources said. “I grew up right here across the street, it’s something that has been on the frying board for many. many years. The road opened today I know they have several other work in terms of making it complete and making it work better. But likewise I think it is a good thing it finally happened,” Sen. Marvin Blyden added. Those officials say some of the additional projects include installing the traffic light, completing the sidewalk, and the entrance for the Nadir community.